Alexis is so in love with Aline that he wants to share this joy with the whole village. Most grooms would make a speech… but Alexis engages a sorcerer to brew a love potion in the vicar's teapot. What will happen when the drugged wedding guests wake up and fall madly in love at first sight? Join Edinburgh-based company Cat-Like Tread for an evening of music, magic and marital mismatchings in Gilbert and Sullivan's classic show. "For careful execution and straightforward fun, it is difficult to imagine many recent productions of Gilbert and Sullivan have beaten Cat-Like Tread’s The Sorcerer at Paradise in Augustines... That Cat-Like Tread are packing out the venue for such a comparatively little-known piece reinforces their belief that there is room for more G&S on the Fringe, and is testimony to the care they put into their work." "I can recommend the performance not just to G&S lovers but to anyone looking for an evening of light entertainment, good music, good singing and good fun." "Highly recommend this, whether you love G&S or not!" "The choreography, acting and singing were excellent, making the story easy to follow for anyone new to G&S. I particularly enjoyed how the chorus was used... The a cappella overture was an original and enjoyable way to start. I would definitely recommend this show." "What a brilliant show! A dry imaginative production, full of humour and well-sung. Great pace throughout. Loved the overture sung by the company - a great and amusing start to the show. Well done all!" 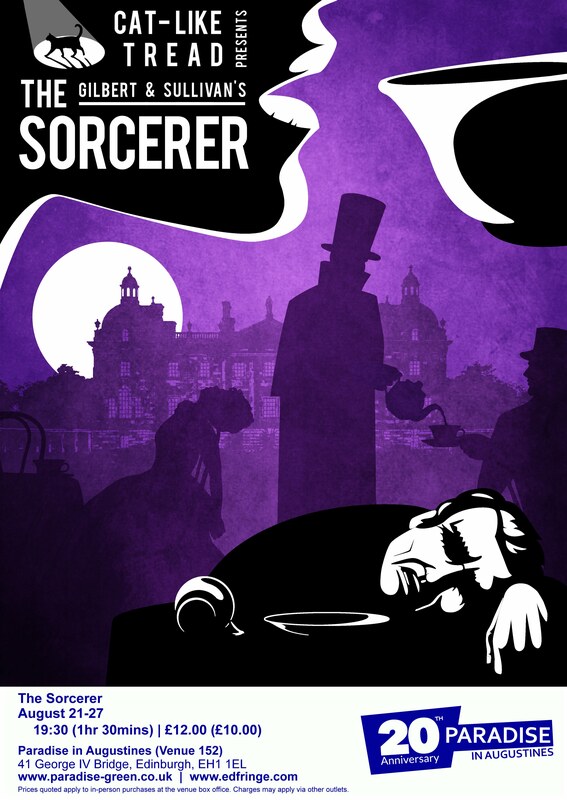 "The Sorcerer is a funsize Gilbert and Sullivan, and rarely shown, although it was featured in the Mike Leigh film Topsy Turvy. It is handled here with great lightness of touch and brio. The large cast radiate enthusiasm, turning themselves into a vocal orchestra for the overture, falling in love with the most unlikely people, and running through Gilbert's sublimely tongue twisting patter with perfect enunciation. Recommended." "Despite being a G&S devotee for over 5 decades, Sorcerer is not my favourite show. The plot does not quite work, and the character of the Sorcerer is inconsistent. Step in Cat-Like Tread with subtle twists making the Sorcerer real, if frightening, and the end of the show a brilliant twist. This crew are really good, and this show keeps up their very high standard. Please can I buy tickets for whatever their next show is." "Absolutely loved tonights performance. It was very cleverly done and all the singing was outstanding. Everything was done to perfection from direction to costumes. One of the highlights was the overture." "An absolute cracking show, with comic turns and darker nuances throughout. Little touches, such as the thoughtful and occasional use of the aisle serves to pull the corners of the stage into the audience. It's now too late for 2017, but I would strongly recommend getting your 2018 tickets as soon as announced as they will sell out."